It's getting cold, winter seasonal foods are appearing in supermarkets, and at Cyberclick we have launched the prediction of the 5 digital marketing trends for 2016. Do not forget to take them into account in your future marketing plans! 1# Instagram and snapchat will gain ground among young audiences. According to a study recently published by the Wall Street Journal, Instagram is already the favorite network of adolescents between 13 and 19 years. As for Snapchat in just two quarters it has managed to rise above Facebook in their likes from scratch. If your brand is aimed at this age, do not miss this opportunity! 2# Mobile is king. Mobile phones are now the primary means of access to the Internet over laptops, desktops and tablets. The time has arrived to rethink strategies so that mobile marketing is not a secondary adaptation but wins all the attention that it deserves. 3# Native advertising wins over invasive formats. 2015 was the year of ad blockers. Facing the unstoppable growth of these programs, in September Youtube tried to penalize the use of AdBlock extension. But the truth is that there is no turning back: users are fed up with invasive advertising and the results are not up to par. According to research by Google, 56% of displays never come to be seen by a real user, so it's time to remove them from your marketing plans. The answer is not to try to limit the use of blockers, but offer formats that integrate with content and they get to please, entertain and be useful to the users. 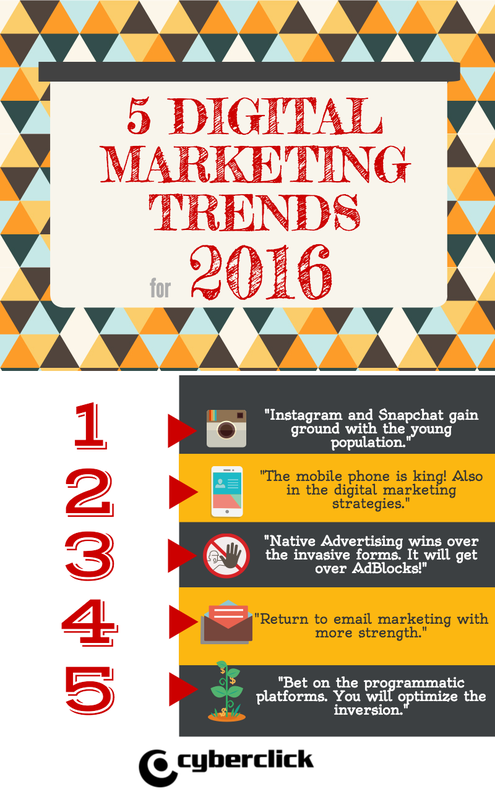 Therefore, native advertising will be a star of digital marketing trends in 2016. 4# Return to email marketing. Far from being obsolete, email marketing is increasingly revealed as a powerful tool to reach your audience at the right time with the right message. Take advantage of its potential for retargeting and watch your conversion rates go through the roof. 5# Bet on the programmatic platforms. Another trend to note in 2016 is the platforms, a solution that allows advertisers to optimize their investment in online media. Through a series of algorithms, these programs perform the most suitable purchase to the campaign objectives, greatly simplifying the process and reducing the possibility of human error. According to data from ANA and Forrester Consulting, programmatic buying represents 20% of the online investment and 54% of large advertisers tested. 2016 will be your year!